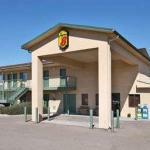 Located off Interstate 10, this Benson, Arizona hotel serves a daily continental breakfast and features rooms with free Wi-Fi and a cable TV. San Pedro Golf Course is just 1 mile away. A microwave, fridge and coffee maker are provided in all rooms at the Super 8 Benson. Each classically furnished room includes a spacious work desk. Free access to the seasonal outdoor pool on the sun deck is offered to all guests. The hotel staff is available around the clock at the 24-hour front desk. Guests of the Benson Super 8 are provided with discount coupons to the adjacent Denny’s Restaurant. The Benson Museum is just a 5-minute drive from this hotel. Kartchner Caverns State Park is 11.9 miles away..
We plan to add more related stuff like: pet friendly hotels in Benson, Arizona dog friendly hotels in Benson, dog parks in Benson, pet stores in Benson, AZ, and pet spas in Benson. Keep checking for more!